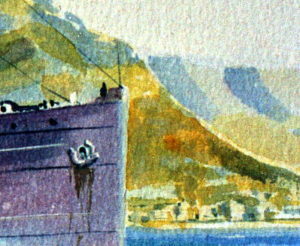 A watercolour measuring 20 x 90 cm (8” x 12”), sold. Looking for the very best in modern painting investments? You have found them here. 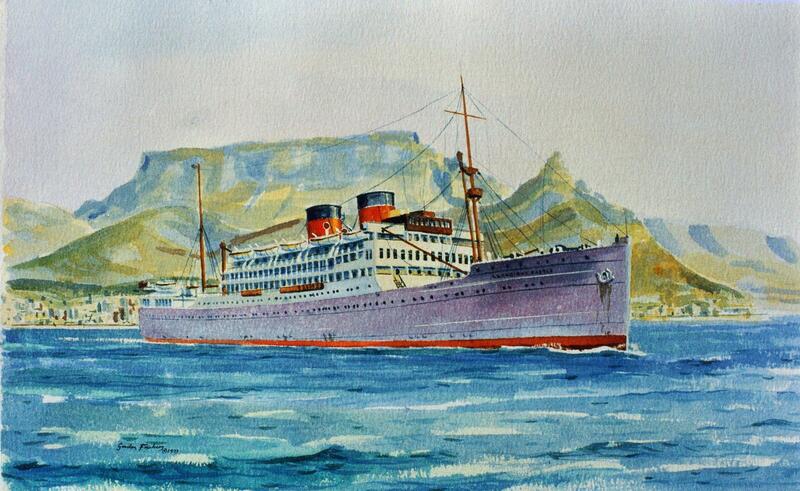 A typical Castle Line regular port of call, Cape Town, instantly recognisable to anyone who knows Table Mountain. This splendid Castle Line ship from the classic age of steamers is a rare example of a ‘Frickers’ watercolour. 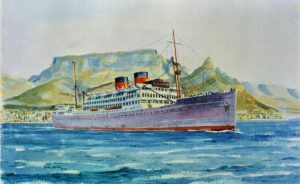 Llangibby Castle was a passenger liner, she was operated between 1929 to 1954. ‘Llangibby Castle‘ was named after the castle at Llangybi also known as Tregrug Castle, in Monmouthshire. The ship, an advanced design in her day, was constructed by Harland and Wolff, at their shipyard in Govan, Glasgow. To acquire this or commission a similar painting available, excellent value, you can make payments in easy stages. Copyright 2018 fees, our Terms , our Guarantee is among the most generous on the Internet, don’t hesitate to ask for details.